Are you a blogger looking for a more paid blogging jobs? I was when I recently read a referral post from a blogging buddy that introduced me to a brand new company called Get Blogged. I visited their site and liked what I saw. They offer paid writing jobs at every blogging level, depending on your domain authority first, rather than your social stats! I signed up and within one week, I received my first paid job! In fact, this introduction post is it. Read on if you would like an in-depth look into Get Blogged. My thanks to Get Blogged for sponsoring today’s post. I will receive monetary compensation as a thank you for my time in helping spread the word about the Get Blogged Platform; which I feel is a benefit to my readers. All opinions are my own. According to their website Get Blogged is the easiest solution for bloggers wanting to monetize their blogs, and for brands, businesses and agencies needing help with, or wanting to outsource their outreach in a cost-effective way. As their efforts expanded, they eventually had too many brands and bloggers to continue doing things the way they had been. The team sat down and planned the creation of a platform that would allow bloggers, influencers, site owners AND brands to all work together with less hassle. The entire team has been hands-on at every level of running and owning a website, many websites in fact! They all have worked hard to pour in years of knowledge and experience into the Get Blogged solution to ensure that all your requirements are covered. What started in the UK has now expanded to the United States and I’m happy they did! For American bloggers and influencers, you’ll first notice that Get Blogged spells a few keywords differently than we do, like monetize and recognize. The second thing you’ll notice is that Get Blogged cares more about your domain authority than they do your social stats. Stats and follower numbers are important, but it’s not a qualifier to apply. They offer paid blogging jobs for bloggers starting with a domain authority of 5+, going up to a DA of 40+. The third difference you’ll notice is that the payment amount of blogging jobs is offered in British Pounds. You’ll be able to see US currency amount easily by highlighting the amount Get Blogged offers you, then right click that number and Google will show you the United States dollar amount. You’ll be able to set your payment preferences on your application. Get Access to Real Blogging Assignments: Brands are looking for bloggers 24 hours a day, log in pick up assignments now. Work on Exciting and Interesting Projects: Pick up assignments on anything from zoo trips to dating sites. Enjoy Instant Payments: Get paid the same day your post is approved. Develop Relationships With Brands: We recruit brands and match bloggers to build lovely relationships. Get Access To Free Guides And Resources: Stay on top of blogging trends, and get helpful tips from our experienced team. Earn Money From Blogging: Enjoy a genuine income and let us help you grow it. A chance to earn points by referring other bloggers with your own referral code. An opportunity to join their paid VIP program where you’ll get first choice on projects. To join Get Blogged and get paid blogging jobs, register here using my referral link. If you join with my link I earn Karma towards an entry for prizes. Thank you in advance if you do use my link. A platform where you can quickly and easily build relationships with trusted bloggers. Assistance with the promotion of your business or services via sponsored posts on high authority websites quickly. Access to social influencers who will talk about your business and engage customers. To learn more about Get Blogged blogger outreach, please go here. Savvy bloggers and influencers know that the more companies you work with, the better chance you have of reaching your financial goals. I think Get Blogged offers a refreshing take on the whole project application process for us. Honestly, applying for this paid job, was as simple and painless as can be because once your application is filled out, you are good to go. 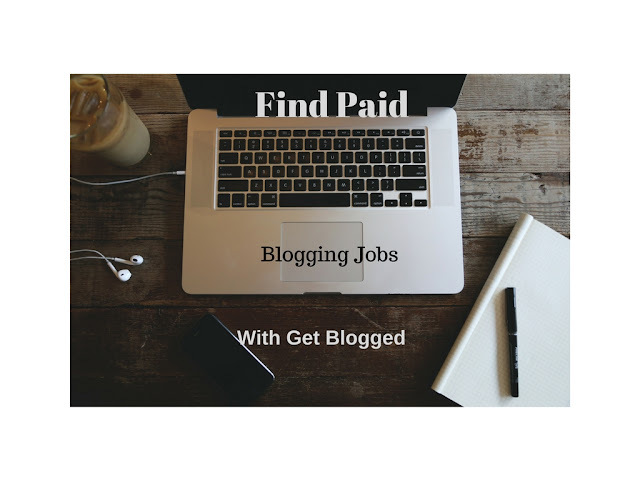 Head on over to Get Blogged today to get started on finding more paid blogging jobs. Please share in comments: Have you joined any new paid blogger platforms recently?